Update, August 2015: Yuuka has closed down. Just when I thought I was hopelessly addicted to No.6 fried chicken ramen with soy sauce broth at Dosukoi in Allendale Square, a new obsession has emerged across the street. Again, it’s a hot hearty meal in a bowl. 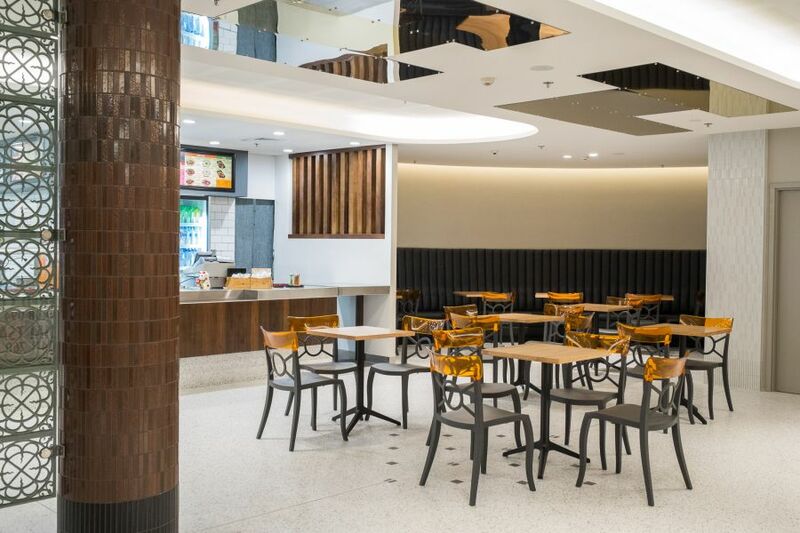 Trinity Arcade is undergoing renovation and Yuuka Rice Bowl and Tempura is a new arrival at the street level of the arcade, St George’s Terrace end. 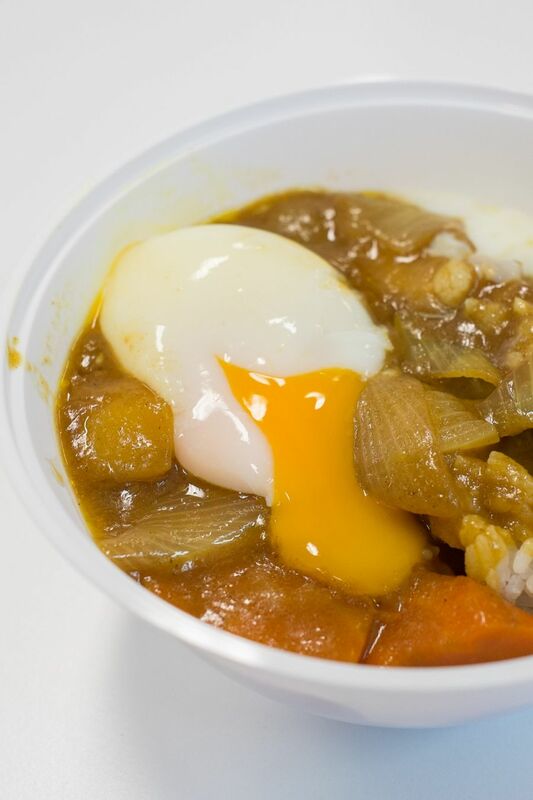 All the rice bowls have an ‘ontama’ option where for an extra dollar, a half-boiled egg is cracked into your bowl (note: South East Asians say “half-boiled egg” rather than “soft-boiled egg” – it’s essentially the same thing). My first taste of Yuuka was the Ontama Chilli Pork Bowl, with chilli beancurd and pork mince with pickled mustard served on rice with a wonderfully slippery, jelly-like soft egg. 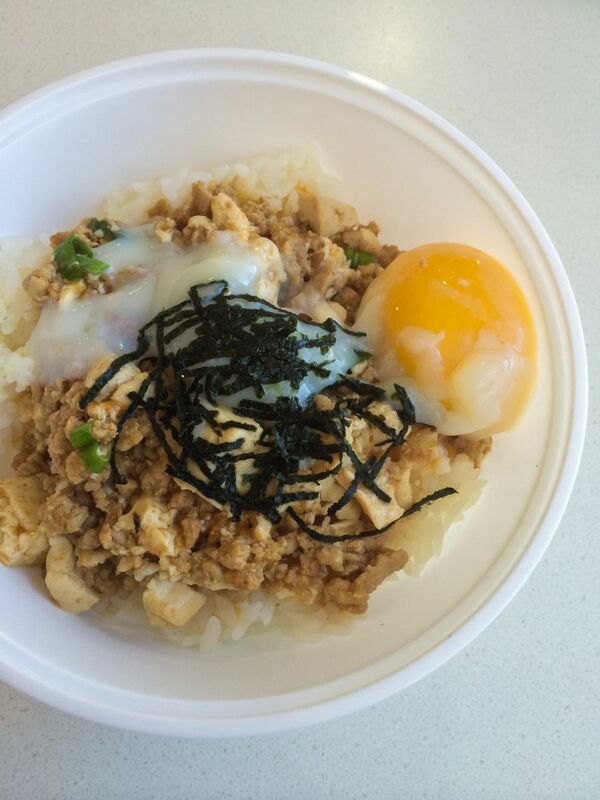 My takeaway ontama chilli pork bowl, with half-boiled egg (medium AU$7.50). After my short walk back to the office with my lunch in its takeaway bowl, the egg white had slid across the chilli beancurd and parted company with the yolk, but phwoar, it was magnificent. The chilli heat was pretty mild. All I needed was a spoon. Homestyle meals in bowls have a magical soothing effect on stressful days – and this one did a marvelous disappearing act too. 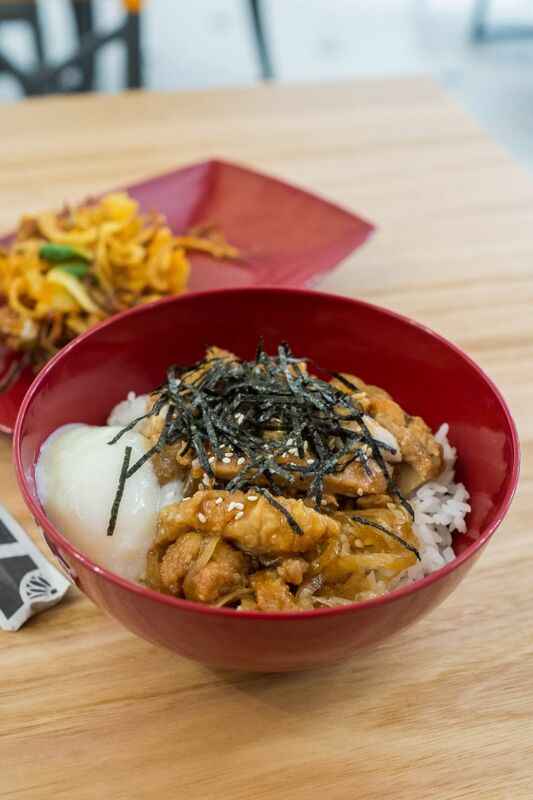 The regular price for a medium bowl is AU$7.50 but they’ve got an opening special where a medium rice bowl or medium udon noodle soup is only $5 – it’s simple goodness in a bowl and superb value. 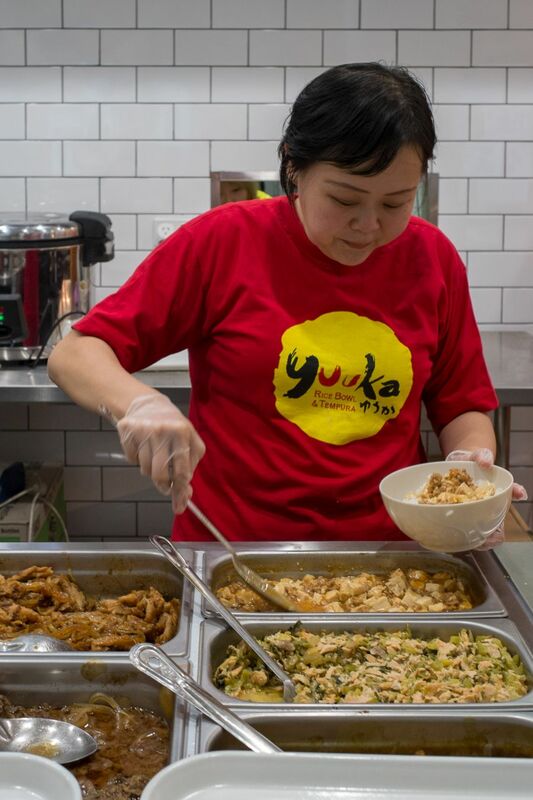 Without the special price, it’s a great option for a quick, cheap lunch: medium bowls range between AU$6.50 to $7.50 and the most expensive of the large bowls are AU$9.50. As soon as you make your choice, your order is quickly assembled before you – rice out of the cooker, chosen topping ladled from the bain marie, optional egg added, along with garnishes. 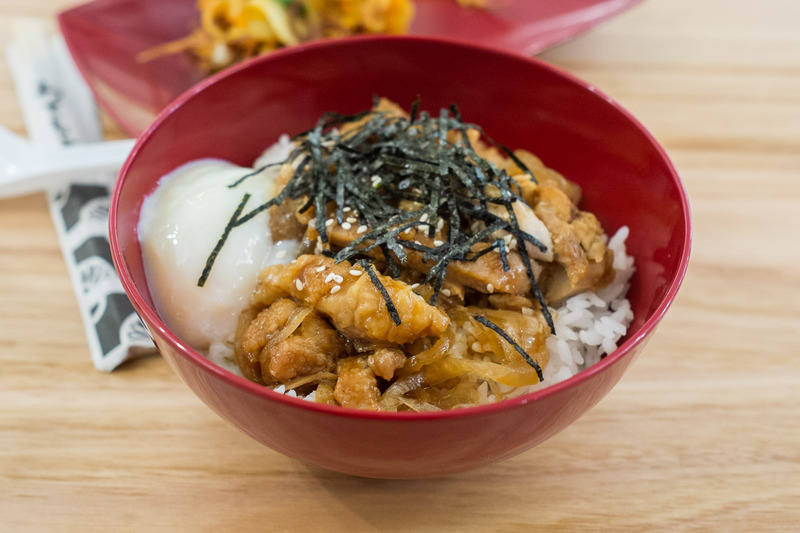 On Tuesday, I tried the Ontama Teriyaki Chicken Bowl. It was just as satisfying as the chilli pork. The egg was gloriously oozy, the teriyaki chicken cooked with sweet onions. I wrote earlier this week about comfort eating at my favourite Chinese BBQ restaurant – I think I’ve found another source of comfort for work days. 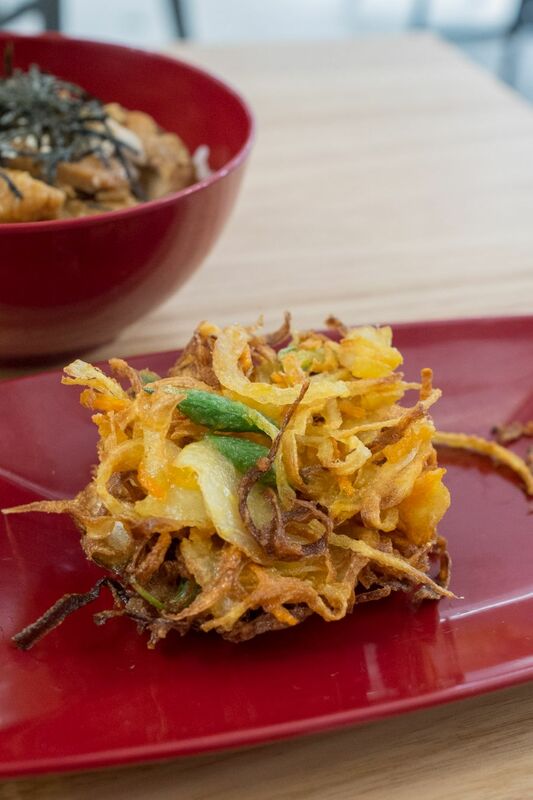 If a magic bowl of awesome isn’t enough to perk you up, there’s deep-fried sorcery also going on, with a self-service tempura bar next to the cash register like the diabolically placed chocolate bars at a supermarket check-out. Actually, the tempura bar was the first thing I noticed as soon as Yuuka had opened for business. 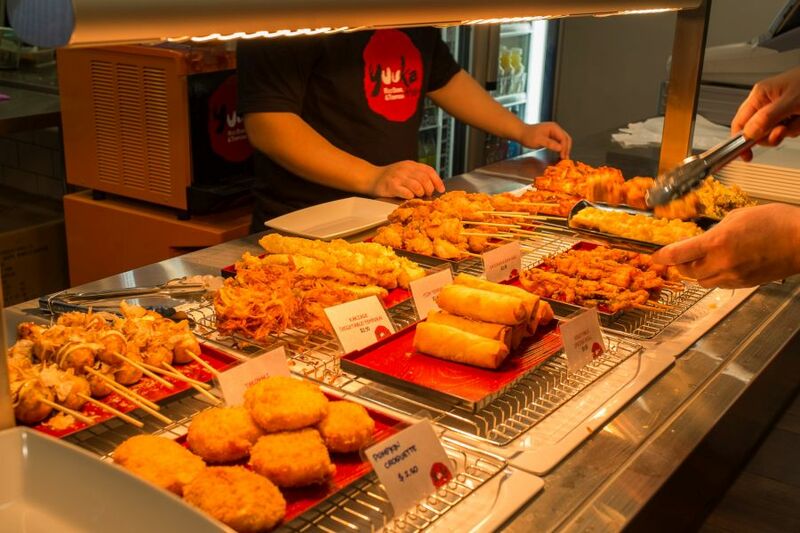 It’s hard to miss the golden glow of deep-fried temptations, which may vary daily and has included takoyaki (octopus balls) on skewers, vegetable tempura, pumpkin croquettes, spring rolls, karaage chicken on skewers, enoki mushroom tempura squid tentacles, fish cake skewers and deep fried fish fillet. It’s early days and I’m still to figure out the optimum timing for tempura freshness (apart from being there for the first drop from the fryer); it’s one thing to keep the bar stocked up but if the items don’t move quickly, the deep-fried oasis will be as good as a mirage. In the spirit of impulse-buying at the check-out, I chose a serving of vegetable tempura (AU$2.80) to go with my chicken teriyaki rice bowl. It wasn’t popping crisp, but still a very tasty asteroid of shredded vegetables, almost onion bhaji-like (without chickpea flour and Indian spices, of course). There is tempura dipping sauce, mayonnaise and other condiments to help yourself to on the other side of the cash register, but after the first few sauce dips I found I was quite happy to chomp through the rest without sauce. My workmate C had the Chilli Pork Bowl minus egg and thought it was fantastic. 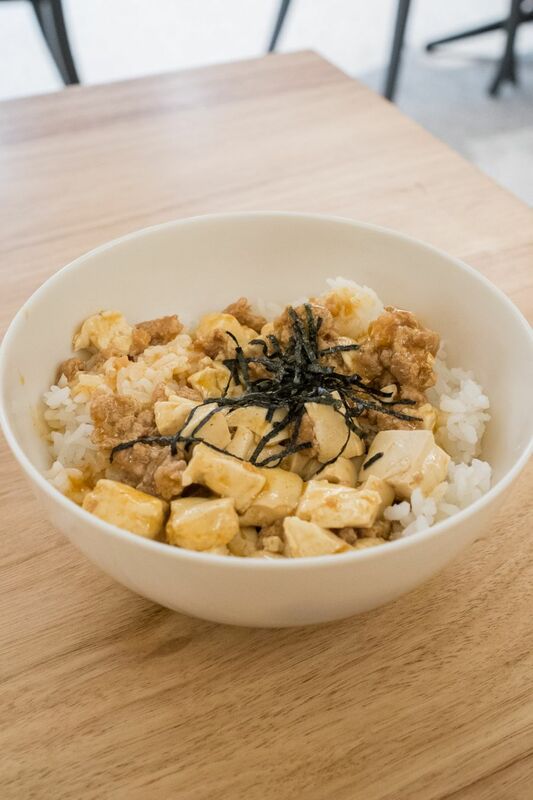 There are other rice bowls to try, including stewed beef, kimchi beef with Chinese cabbage pickles, Japanese curry, and salmon flakes with pickled mustard. I won’t be going ga-ga over the noodle soups as they only offer udon, which I’m not a fan of, but I have no doubt the rice bowls will keep me delighted for a good while. Since posting my original story, I’ve been getting lunch at Yuuka every second day or so. The Nagoya deep fried chicken wings are a recent addition to the tempura bar. They are bone-suckingly good and I was hooked from my first taste. 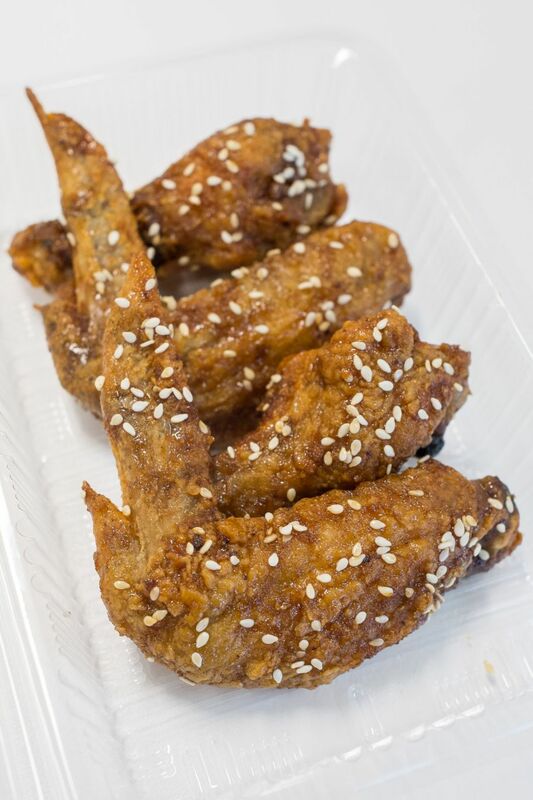 Nagoya no Tebasaki – Nagoya deep fried chicken wings – AU$1.50 each). I shared these with a workmate today. To go with my chicken wings today, I got the Ontama Curry Bowl. 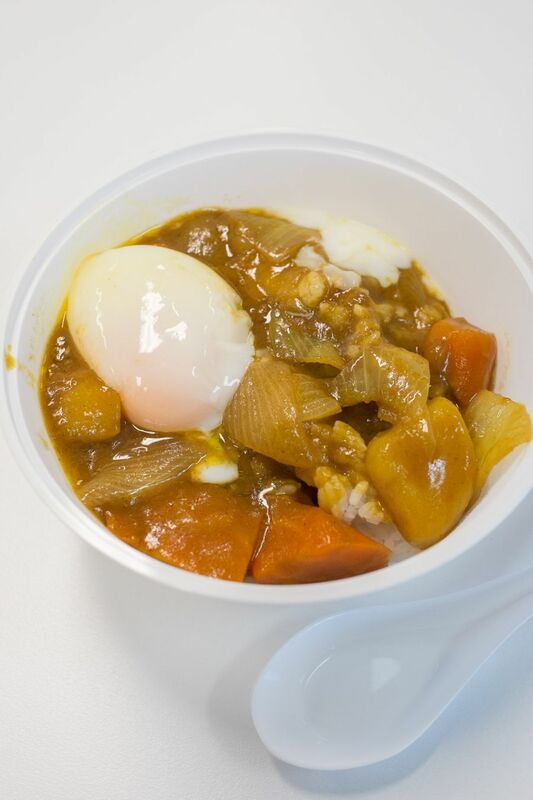 It’s a vegetarian Japanese-style curry with onion and chunks of carrot and potato. There’s a Beef Curry Bowl, with curry and stewed beef, but I think I’ll stick with my veggie curry and chicken wings combo. Or the Ontama Chilli Pork bowl, still my favourite. I reckon since I first blogged about Yuuka, they’ve turned up the heat just a little on the chilli beancurd and pork mince. But no matter which rice bowl I choose, it’s impossible to resist the allure of the half-boiled egg. I couldn’t order a rice bowl without it now and knowingly miss out on this glorious pleasure – I’ve been ordering all my rice bowls ‘Ontama’. In case you missed it above: Update, August 2015: Yuuka has closed down. Was only open for lunch.